Why is it that we get excited to check into a nice hotel room? It could even be complete with tropical carpet and bed spreads, but it’s still inviting. It’s because it’s clean and opened feeling. There are minimal items in there, only the necessities. You don’t walk in to piles of laundry to be washed or folded, kids toys on the floor, and the bed unmade. No, you walk in to a fresh start. And it’s nice. Now, I’m not going to ask you to turn your bedroom into something you would see at a 5 star hotel, but then again, why not? Why should you have to pay money to a hotel to have a relaxing quiet getaway? You deserve to have a relaxing room just like that in your own home, tropical patterns optional. So, where do we start? Break it down! Don’t do this all in one day! Make this into smaller tasks that suit your needs. If you want to do one item in one day, fine. But if you’re the type who still thinks that’s too big of a task, whittle away 15 minutes at a time. It will eventually get done. You’ll be amazed what you can accomplish in 15 minutes! Ahhh, that’s always the first step, isn’t it? Set your timer and tackle the clutter in your bedroom 10 – 15 minutes at a time. More if you’re willing. Get rid of everything that doesn’t belong in there… stuff you’re stashing to drop off at Goodwill, kids toys, things that belong in other rooms, trash, etc. You can put items in a laundry basket or box and carry them out of the room to their destination once you’re done. That way you won’t go out to put something away and forget to come back! 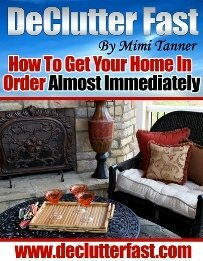 For more tips on decluttering, click here. I know… some people think “why bother, I’m just going to get back into it tonight”, and I was one of them. I started making my bed though and it makes a difference. It’s not perfect, but close enough, and it takes me about two minutes. In return for making your bed, you get a sense of order and pride in your home. Later, when you walk in your room, it looks a lot more like that 5 star hotel than a college dorm. Sometimes the littlest things can start to make a big difference. So, exactly what would your 5 star hotel room look like? Would your favorite books be on the bedside table? Would there be fresh flowers, or a favorite photograph or painting hanging on the wall? Even if you don’t have a budget to do anything new right now, you can still go around your home and find things that make you feel good and use them to help personalize and decorate your bedroom to your liking. Make it a special place for yourself. If just getting your room decluttered and things put away is more then enough work to take you through February, then that’s fine. Any sort of progress deserves a pat on the back. 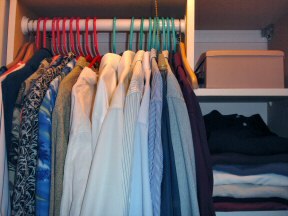 You can organize your closet at another time. But don’t forget about it entirely because it certainly feeds into how your bedroom functions. If your bedroom is where you get dressed and your closet is spilling over, it’s going to spread into your bedroom, and we don’t want that. If you’re ready, you can click here to read more about organizing closets. I think that’s more than enough for a short month! And if your bedroom is already your dream room, then you can find another area of your home or life to focus on! There’s always more opportunities for getting organized. It’s an ongoing process. You can take a stroll through the website to find an area of interest to focus on. Do it in small sessions, not all in one day!